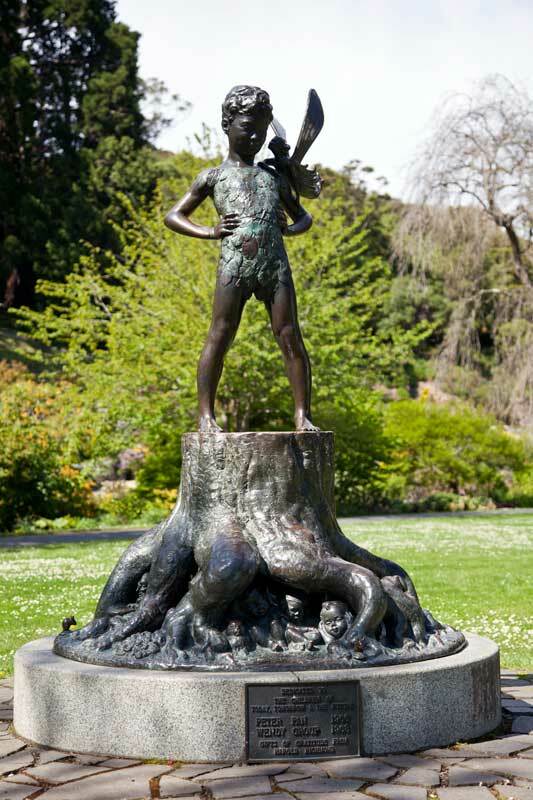 To commemorate the 150th Anniversary of Dunedin Botanic Garden, Ouroboros, a worm sculpture, was selected from the 16 proposals put forward for consideration. The sculpture is sited on a landscaped site adjacent the Tea Kiosk. 15.5 metres long, the worm sculpture is made from tubular stainless steel which is divided into hundreds of rigid and pliable scale-like segments. It lies over the ground with sections of it held up by three crutch shaped supports. 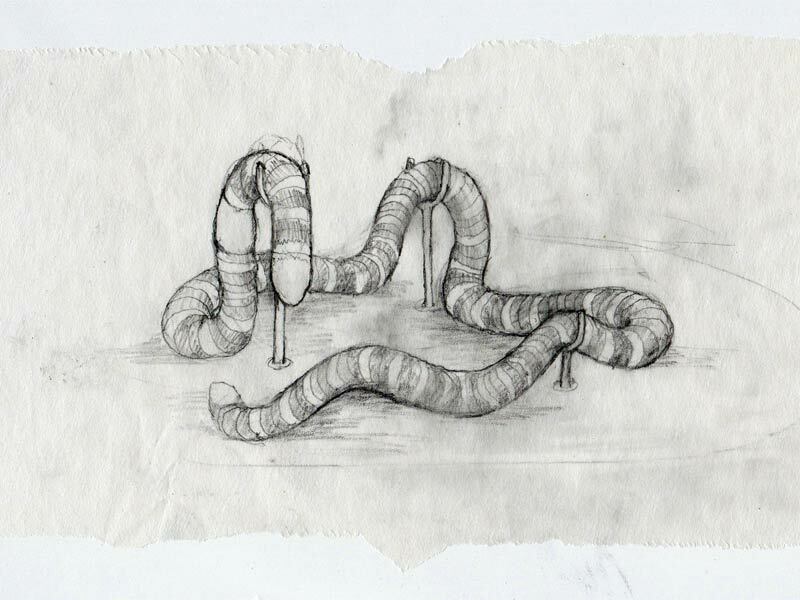 The worm can be climbed over sat on and moved by varying degrees, to give it a unique tactile element. The artist, Julia Morison, was a recipient of the Frances Hodgkins Residency for 1999. Dunedin Public Art Gallery collaborated with the Christchurch City Art Gallery to put together a major exhibition of her work ‘a loop around a loop’. The Lions – one is snoozing, the other watches…. one eye open. The lions first appear in photographs in front of the Winter Gardens from 1966. 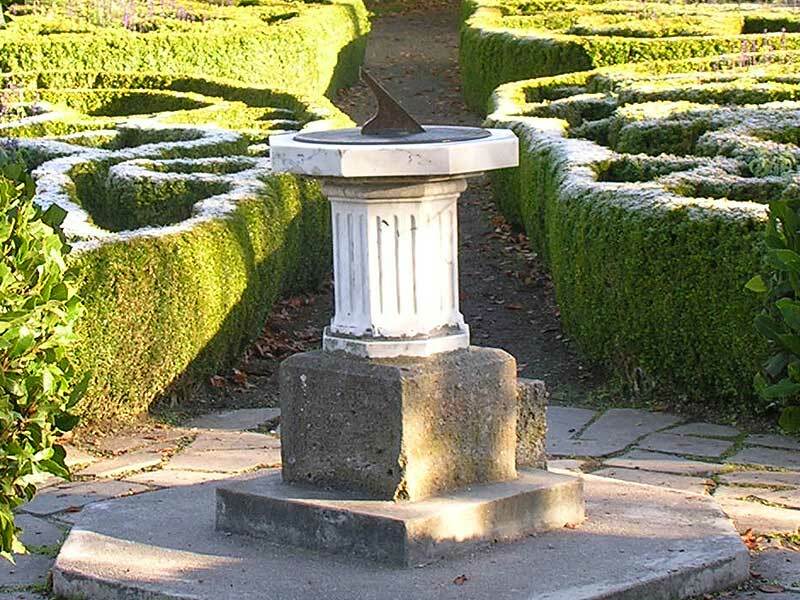 It is believed they came from Littlebourne House but there is little documented history. 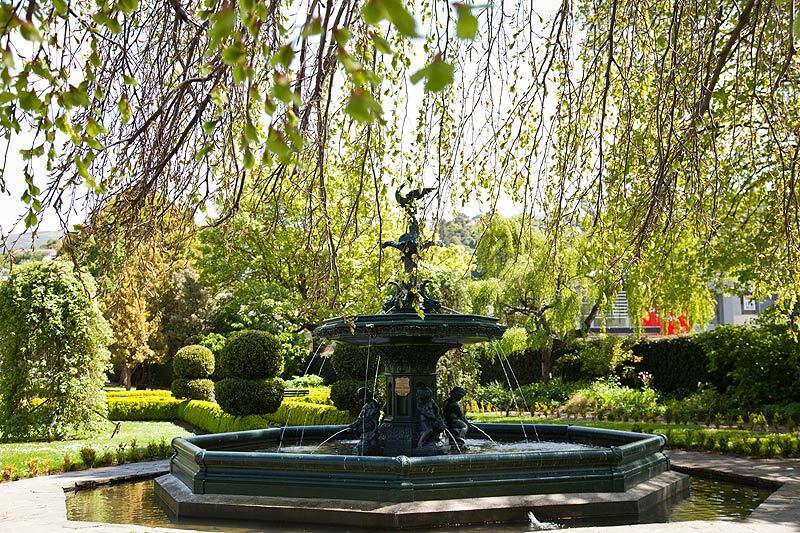 Wolf Harris Esq was one of Dunedin’s successful businessmen and gifted this fountain to the citizens of Dunedin in 1890. It was first erected in ‘The Triangle’, later named Queens Gardens, but removed to make way for the Cenotaph after World War One. It was held in storage until the New Zealand and South Seas Exhibition at Logan Park in 1925-26 when it was resurrected and erected in the ‘grand court’. 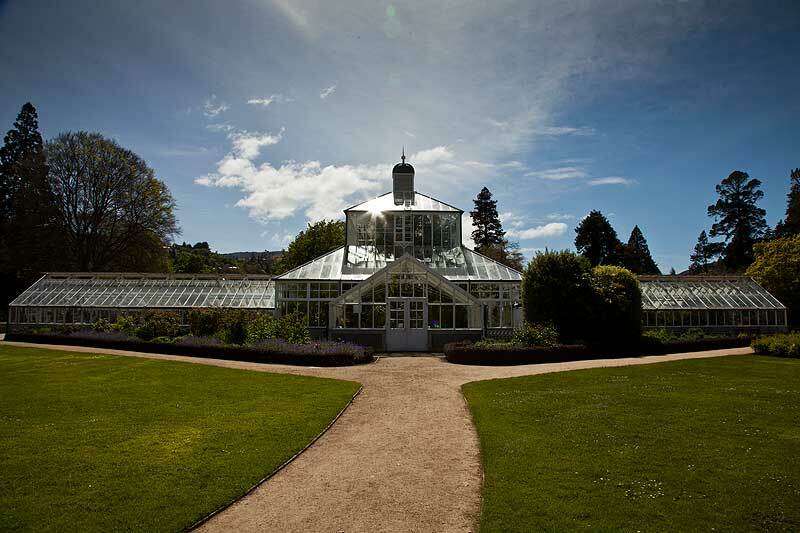 After the Exhibition, it was relocated to the Botanic Garden. 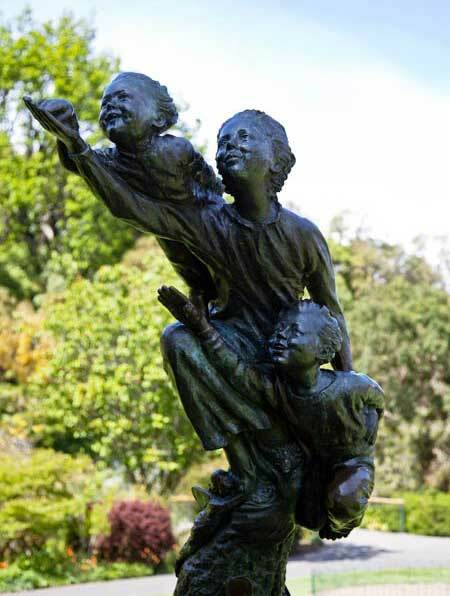 Dedicated to ‘the Children of Today, Tomorrow and the Future’, this statue was donated by Mr Harold Richmond of Green Island. Crafted by English sculpture Cecil Thomas and cast by John Galixia & Son, Bronze Founders of London, Peter was installed in1963. 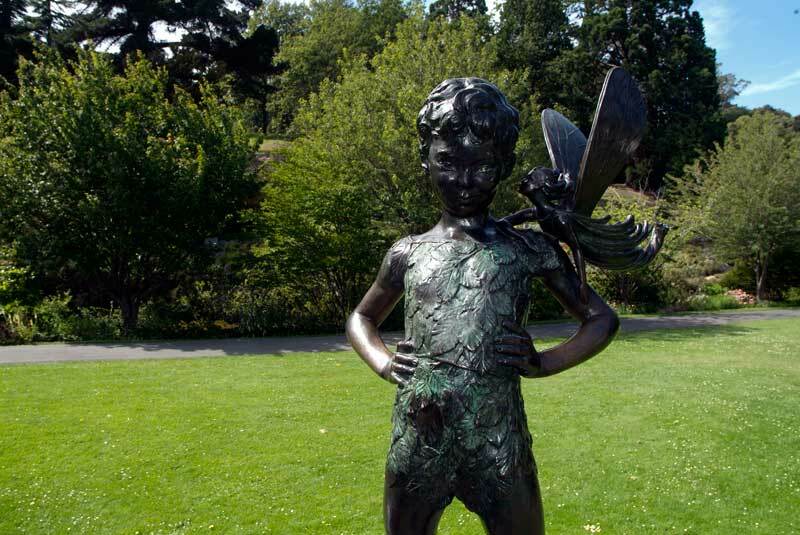 Wendy was a second gift from Mr Harold Richmond of Green Island and from the studio of English sculptor Cecil Thomas and cast by John Galixia & Son, Bronze Founders of London. Wendy was installed in 1966. Chippie (Mark IV) – A bronze effigy of the little terrier and a replica from the memorial to ‘Tubby’ Clayton (the Reverend Philip Thomas Byard Clayton). 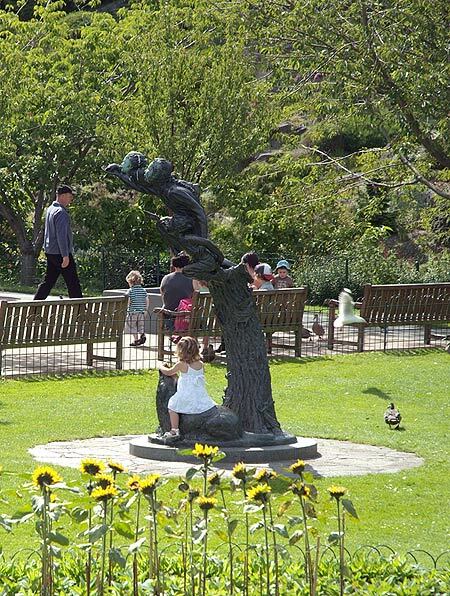 The fourth in a line of terriers gifted from the Royal Kennels, Dunedin’s Chippie was unveiled on 4 March 1999 and was a gift to mark the 50th birthday of HRH Prince Charles and to acknowledge the English sculptor Cecil Thomas. The first acclimatised fresh water game fish to be liberated in New Zealand, brown trout were released in Otago in 1869. A shipment of ova from Tasmania was hatched, reared and released into the Water of Leith. 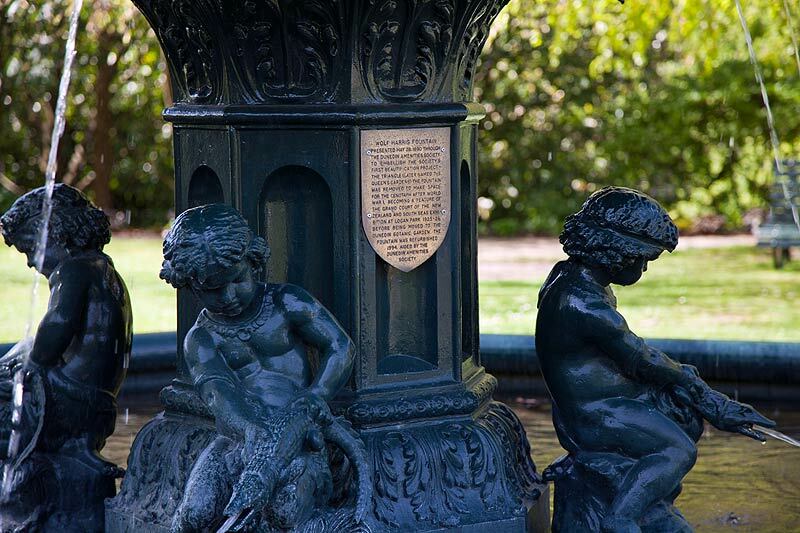 This bronze brown trout was cast and gifted by the Otago Acclimatisation Society to commemorate the work of Mr Clifford, the manager who was responsible for the success and introduction of brown trout in Otago waters in 1869. These massive gates and their supporting pillars were erected in 1925. They were relocated from the property of Mr WS Dawson in Arthur Street and were purchased for a sum of £30. It cost another £165 to have them altered and erected. 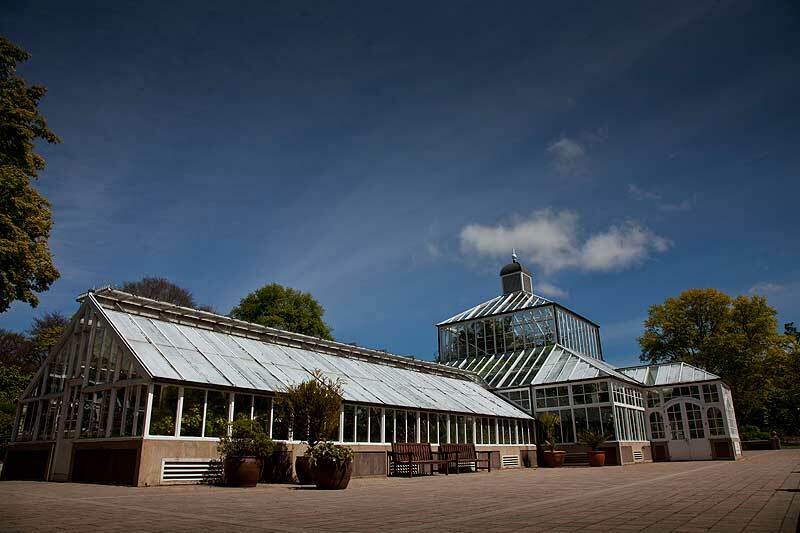 The iron gates and pillars were first erected at the Gardens Corner in 1907. Manufactured by J&W Faulkner, these were of a proprietary design ‘No 102’ embellished with radial wings. Shifted to the Pine Hill Road entrance in 1925, a surviving section of the gate and supporting pillars has been erected at the Signal Hill Road entranceway. Opened on 8 December 1914, the Bandstand was constructed at a cost of £300, a cost shared between the city council and the Garden Fete Committee. 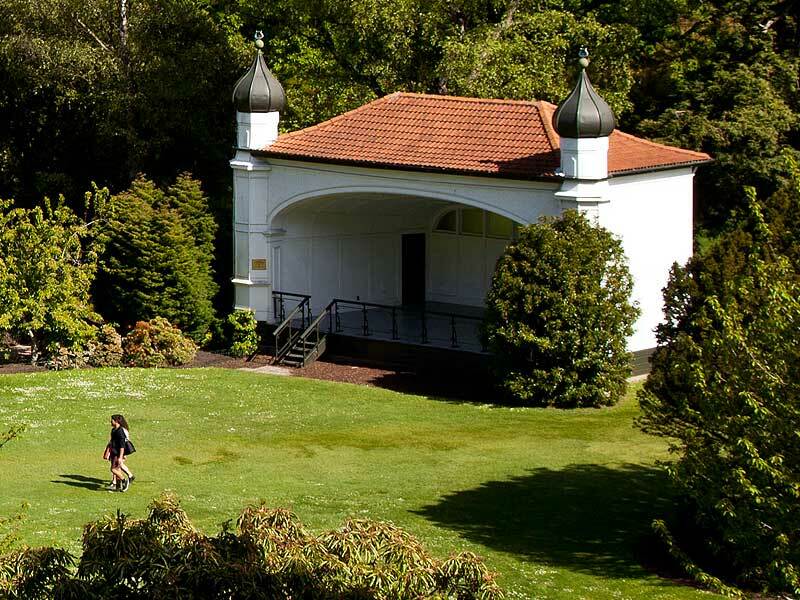 The first bandstand was reported as being present from 1885, but, by 1901, it was falling into such a state of disrepair that it was replaced with a pavillon shifted from the Octagon. 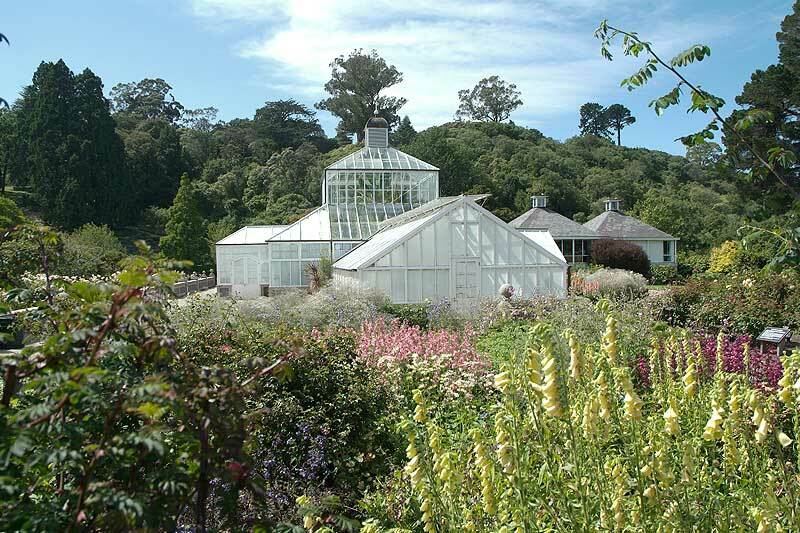 Dunedin was the first city in Australasia to establish a winter gardens complex. Initially, this was to be a three-part development project to be funded by the city council. A fortuitous approach to Mr Robert Glendining in 1907 resulted in a significant contribution being made to enable the project to be completed as a single development. The building was completed at the end of May 1908 and officially opened on 3 October 1908. 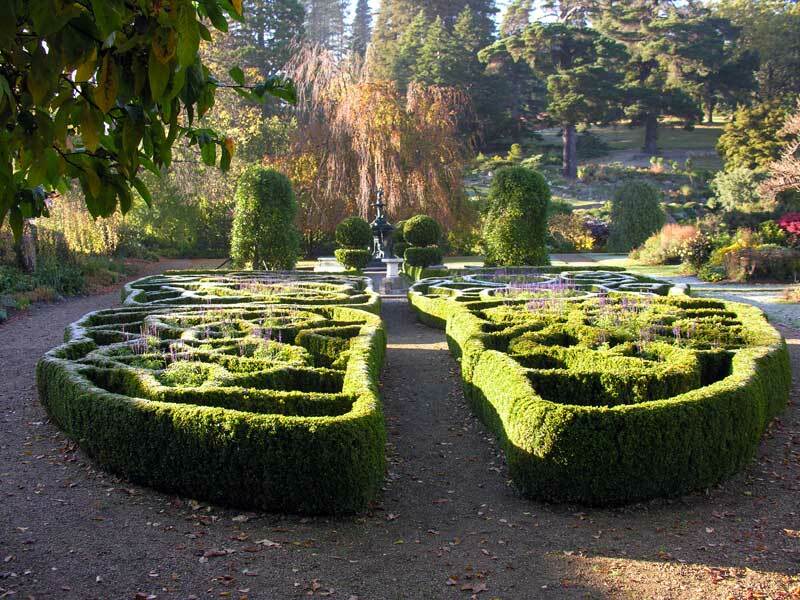 Unfortunately, little is known of the history of this feature other than that it was given to the Botanic Garden at the conclusion of the New Zealand and South Seas Exhibition held at Logan Park and installed in the Knot Garden’s Shakespeare Garden. Planted out in 1934 using Box (Buxus sempervirens), this is an Elizabethan style Knot Garden and a replica of the one in Shakespeare’s own garden at his property in Stratford on Avon. An art installation to commemorate the 150th anniversary of European settlement in Otago, this work was designed by local artist Stuart Griffiths. Inspiration came from the design and pattern of iron work on the nearby gates. The completed entranceway sculpture was celebrated on 17 July 1999. 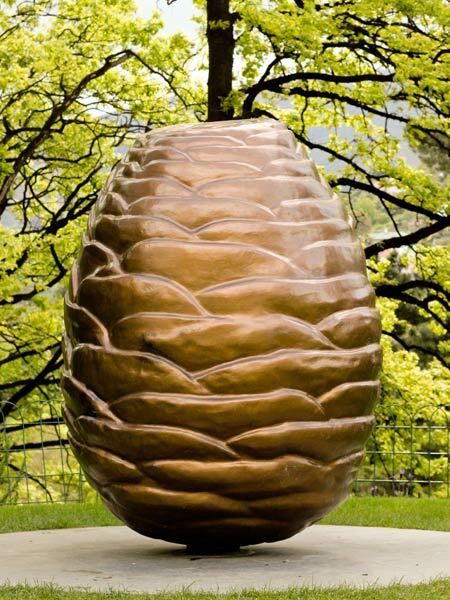 A project funded by the Cedars of Lebanon Club of Dunedin, the cast bronze Cedar Cone acknowledges the close relationship between the peoples of Lebanon and the revered Cedar of Lebanon, Cedrus libanii. 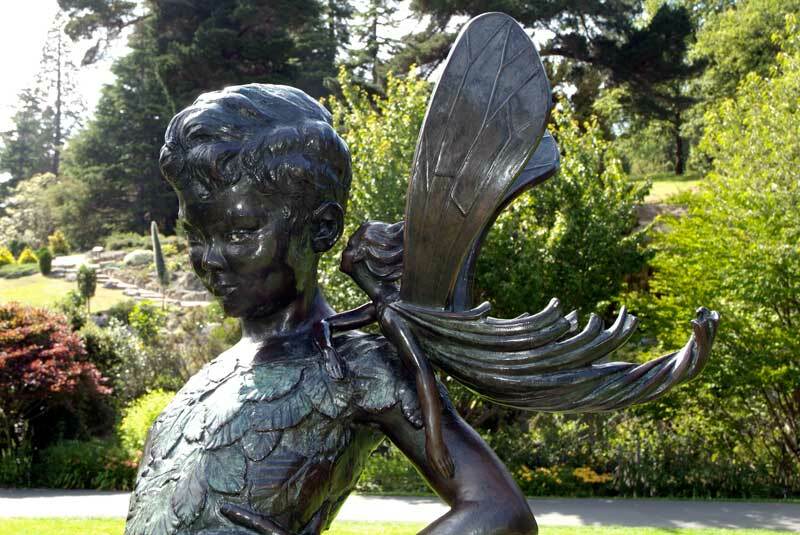 The Otago Sculpture Trails booklet highlights some other interesting sculpture around Dunedin city environs.